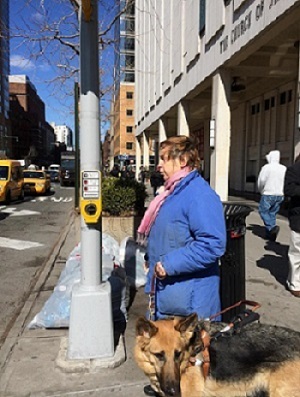 PASS’s mission: to work to ensure that blind, visually impaired, and deaf-blind individuals have full access to the streets and sidewalks of New York. Our goal is to work closely with other stakeholders interested in pedestrian safety, and the New York City and State legislators, officials, and departments to create safe streets for everyone in New York City. January 4, 2015. Effective today, Maria Hansen of Manhattan will replace Karen Gourgey as the new Chair of PASS. 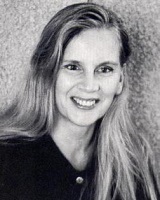 Maria is currently President of Guide Dog Users of New York and Second Vice President of the national organization, Guide Dog Users Inc. She is a founding member of the PASS Steering Committee and brings her training in law, foreign languages, and international affairs to the position. An Accessible Pedestrian Signal or APS is a device usually mounted on a pole near a crosswalk and which gives information about pedestrian signals in nonvisual formats such as audible tones, verbal messages, and vibrating surfaces. The primary purpose of an APS is to let pedestrians with vision or hearing loss know that the WALK signal is on for a particular crosswalk. In New York City visually impaired pedestrians can find an APS by listening for the locator tone, a slow regular tick emitted by the device, as they approach a corner. One activates the APS by pushing the large button. When the WALK signal turns on, this APS button will begin to vibrate for pedestrians who are deaf or hard of hearing, and the device will also emit a clear rapid ticking sound or a spoken message that announces the street name and that the WALK signal is on. The vibration and sound stop when the WALK signal turns off. Click this sentence to see an APS. For detailed information about APS, see Accessible Pedestrian Signals: A Guide to Best Practices. Check this link for accessible pedestrian signal locations in New York City. Click this sentence to find out what accessible pedestrian signals sound like. Vision Zero is NYC Mayor Bill de Blasio’s blueprint for eliminating traffic fatalities in the five boroughs. The City Council’s Transportation Committee together with the Committee on Public Safety is holding a series of town meetings in each of the boroughs to gain community feedback and additional suggestions for the plan. On March 26, �PASS attended the Manhattan Town Hall at John Jay College along with approximately 200 others. We were there to push for the inclusion of APS language in the plan. The deligation included Lester Marks, Audrey Schading, Ellen Rubin, Ken Stewart, and Karen Gourgey. Each member of the public who signed up got exactly one minute to speak. Chairman Rodriguez kept everyone to their time and as a result, 47 people including all of us got to speak. Our issues were sprinkled throughout the presentations, and each of us had a different but important and relevant point to make. The session was recorded and a transcript will be made available. Here is a New York Daily News article featuring Audrey (pictured), and a very quick clip from Channel 11 in which Karen was featured for about 20 seconds. At PASS Coalition we are concerned about all aspects of pedestrian safety. The New York City bicycle culture has been flourishing, and we support responsible bike riding. However, while the growing use of bicycles brings to the city a convenience that many find welcome, it also raises safety issues that must be addressed. As NYC pedestrians know, city cyclists often disregard traffic laws, creating a safety hazard. Of course many do ride responsibly; however, the level of noncompliance is sufficient to pose a danger to the public’s well being. It is very common to see cyclists running red lights, riding the wrong way down one-way streets, and riding on the sidewalk. While every pedestrian is endangered by such behavior, it poses a particular threat to people who are elderly or disabled. People who are older cannot react as quickly, and sometimes fast action is necessary to avoid encountering a bicycle that isn’t where it’s supposed to be. Likewise, a blind or visually impaired person has no way of detecting the approach of a wayward rider until it may be too late. We feel it is the responsibility of the cyclist to ride carefully and with consideration for others, and not the responsibility of the pedestrian to have to execute defensive maneuvers when the danger becomes imminent. Former City Council Transportation Committee Chair James Vacca has been a staunch advocate for pedestrian safety concerns. He led an effort in the Council to draft legislation promoting bicycle safety. Proposals under consideration included increasing the fines for the types of infractions mentioned above, and designating a group of Department of Transportation (DOT) agents to work with the NYPD in ticketing violators. Right now the emphasis seems to be shifting towards going after businesses that hire delivery people who don’t obey the rules. A proposal that these employees wear reflective vests displaying the name and number of their business is a good idea. However, while businesses who hire cyclists do need to be held responsible for their actions, just targeting those businesses is not enough. A common stereotype of the scofflaw cyclist is a food deliverer rushing to bring that hot food come what may. But cyclist violators are hardly limited to food deliverers. Cyclists who break the rules are very common, and they may be anybody. It is not fair to single out the business cyclists, nor does it adequately address the problem. Hold all bike riders equally responsible. If DOT agents are going to be enforcing these regulations, then there needs to be a sufficient number of them assigned to the task. Educational efforts should be increased and strengthened. 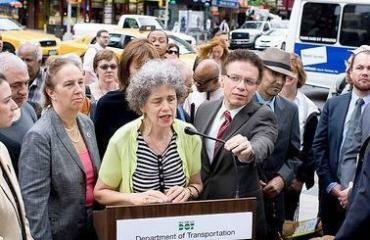 We welcome DOT’s new "Don’t Be a Jerk" campaign and urge that it be made more visible. We also urge that Transportation Alternatives feature its Biking Rules Street Code more prominently on its web site, with print versions distributed to anyone renting a bike or participating in Bike Share. The Bike Share program might also incorporate a one-hour bike safety class, whose graduates could receive discounts when they rent a bike. We believe that promoting the growth of cycling in the city must go together with educating cyclists on the rules of the road. Cycling has truly become a transportation alternative in this city, and we�d like to see this as a positive development. Paying attention to these safety concerns has never been timelier, especially now that the Bike Share Program, soon to arrive, will greatly increase the number of bicycles on our streets. At the very least, this program should include bicyclist education as part of the bike rental process. 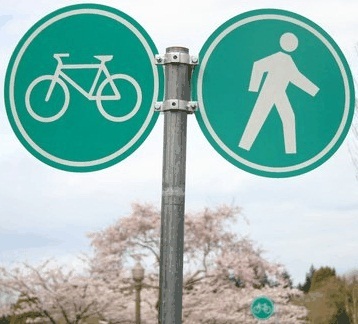 Cyclists and pedestrians can live safely together. It just takes effort and sufficient good will. PASS stands ready to help.